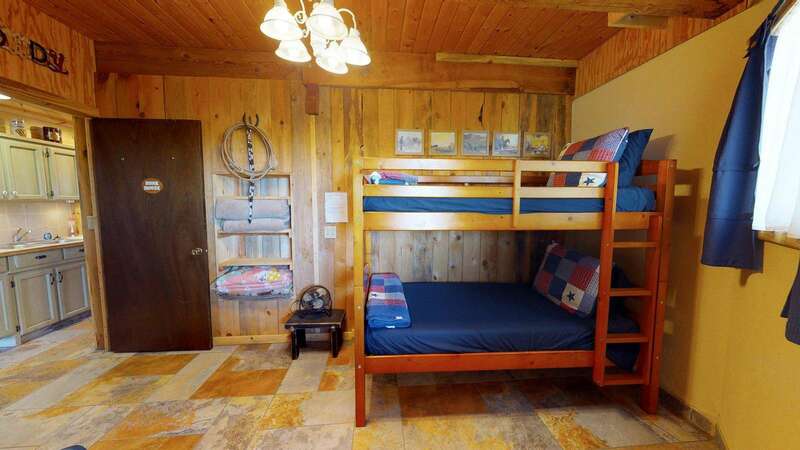 The Juniper Ridge Family Cabin is one of our most "western" accommodations, featuring wrap around deck, fantastic views, TV-DVD, WIFI, picnic table, full kitchen, dining room table, all linens, washer & dryer, night sky viewing, sunrise, sunset. 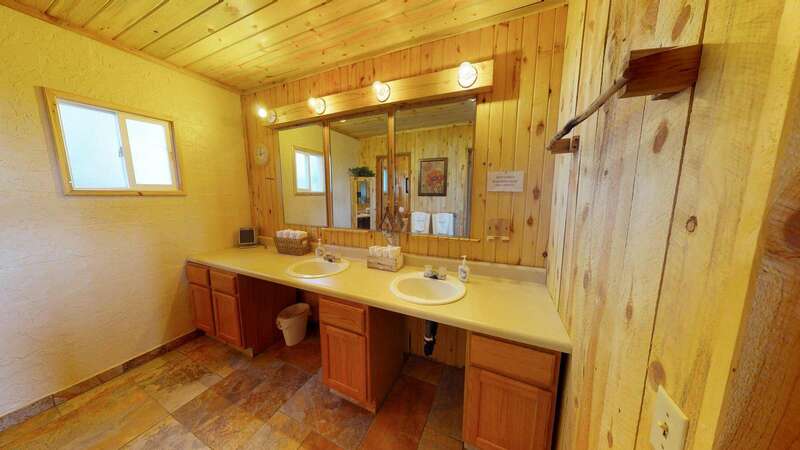 The Juniper Ridge Family Cabin (located 3 miles north of Blanding, Utah) is truly one of our most western cabin accommodations, featuring wrap around deck, firepit, TV, DVD, WIFI, picnic table, fully furnished kitchen, dining room table, all linens, washer & dryer! 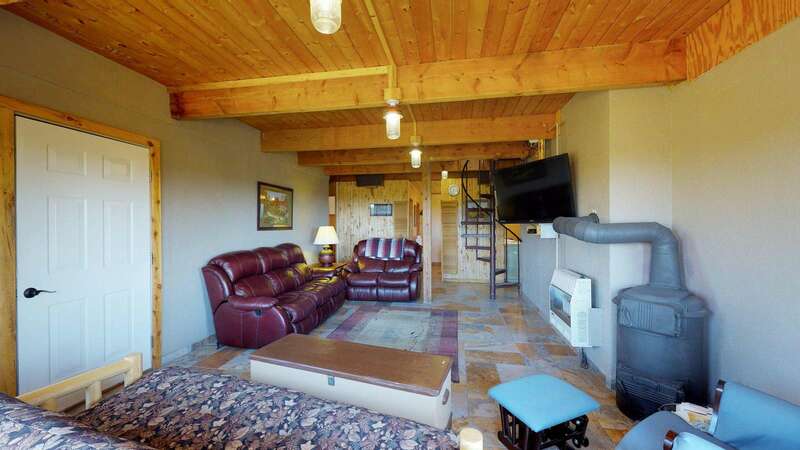 Sleeps up to 10+ people including adults and children. 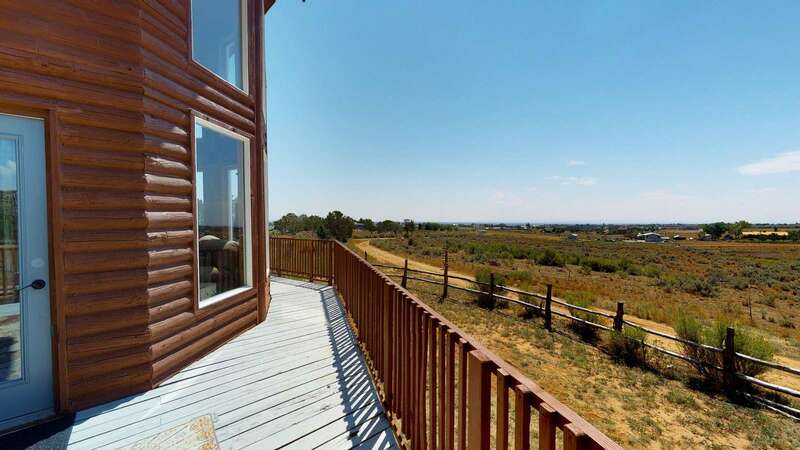 A one-of-a-kind vacation cabin, set alone on Blue Mountain Road with a 360-degree view in all directions as far as the eye can see, Colorado, New Mexico, Arizona, and Utah! Relax on the large deck in the sun or shade. 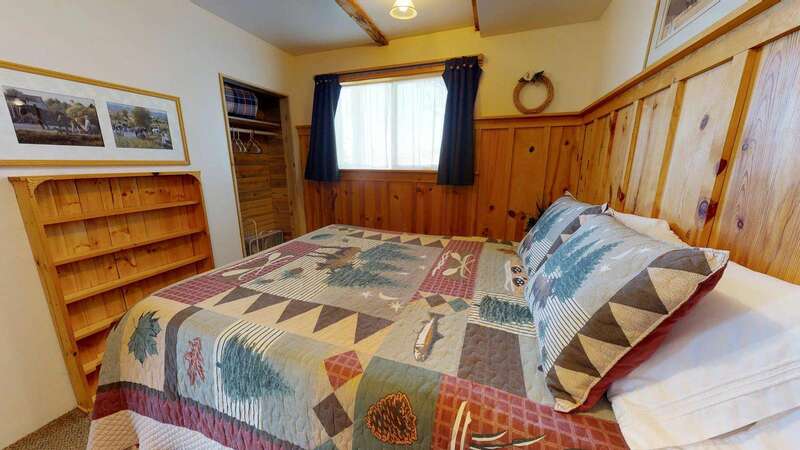 The Juniper Ridge Family Cabin makes you feel secluded, while just two miles away lies the most popular lake in San Juan County - great for swimming, fishing, boating and water sports! 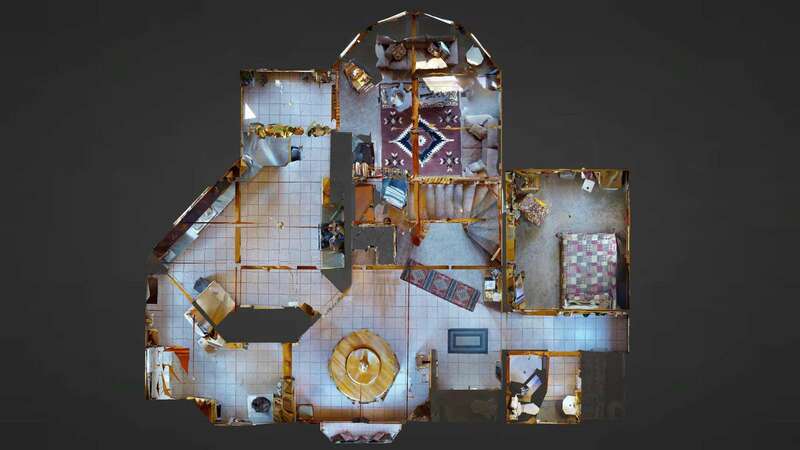 Inside, you'll find much more space than you anticipated - with stunning vaulted ceilings, 5 bedrooms, 2 baths, full kitchen, wood burning stove, very spacious living room, and cozy sofas! 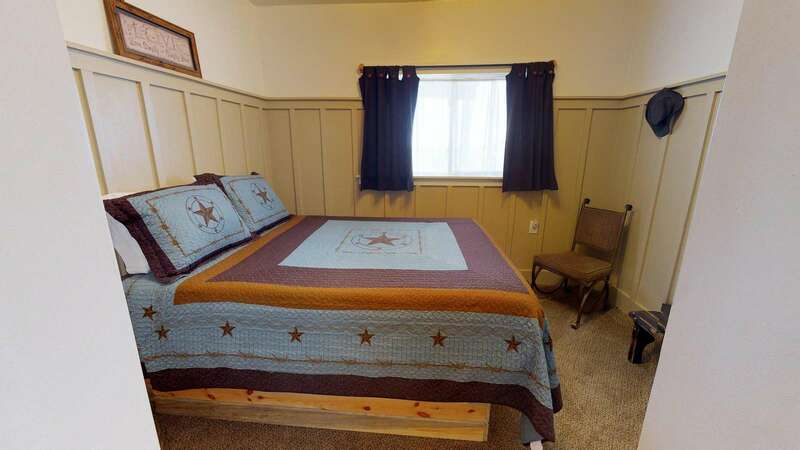 Four of the bedrooms have a Queen Bed for comfort. The last bedroom has a twin bunk bed. All linens (towels, sheets, blankets, pillows, etc.) are provided for you. The kitchen is also stocked with all the cooking and serving utensils - all you bring is the food and condiments! WIFI, TV, and DVD are provided at no additional cost - that is of course if you ever have time to use them. 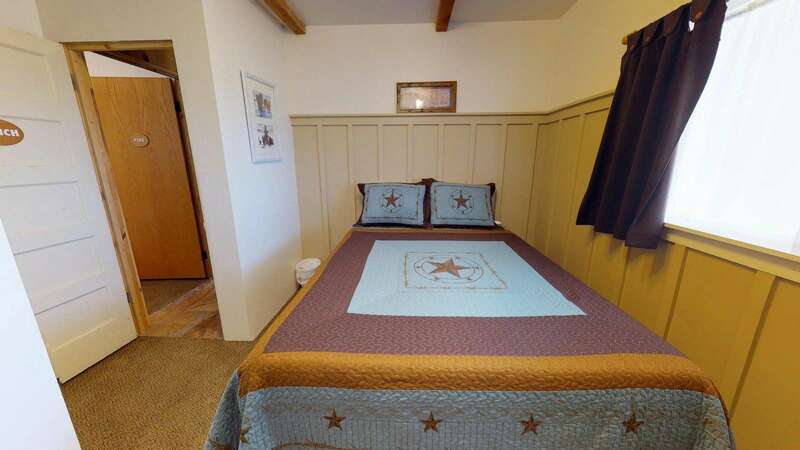 Our guess is, you'll be so busy exploring all the popular national and state parks and monuments in southeast Utah - that's right, the Juniper Ridge Family Cabin is located centrally among more than a dozen of them! (Please note: the house is NOT pet-friendly). 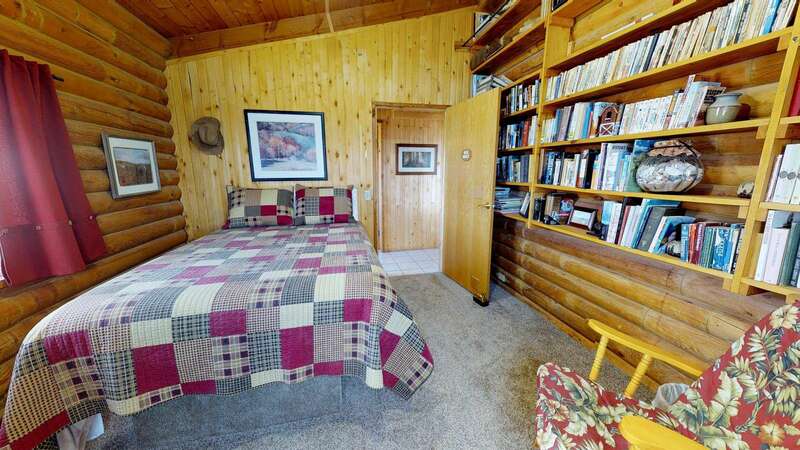 We would like to go on and on, but the photos of the cabin are worth a thousand words! Please feel free to ask any questions you may have or use the availability calendar to check for availability online when you're ready. We look forward to your stay! This property has 4 Queen(s), 1 Bunk(s), 2 Futon(s). 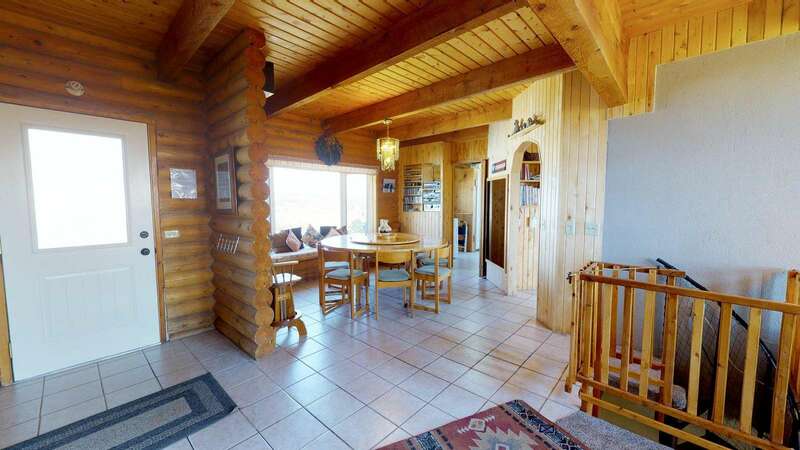 This is an amazing location with great views and stock up on all the necessary amenities. Though we stayed pretty busy doing things away from the location, the hosts were polite, responsive, and very hospitable. 🙂 They had things ready to go for us for a first breakfast after arriving late at night. The facility description does not quite do it justice. The house is very spacious and good for small groups and large groups alike. This is a very good value to stay in due to its location and amenities. My husband and I and 7 of our friends were in the Blanding area for a multi-day ATV trip with our club. We much prefer staying at B&B's or VRBO's to being isolated in a hotel room, and since you can do most of the cooking yourself, you save money and eat just what you like! We found the Juniper Ridge Family Cabin on VRBO and stayed for several nights. 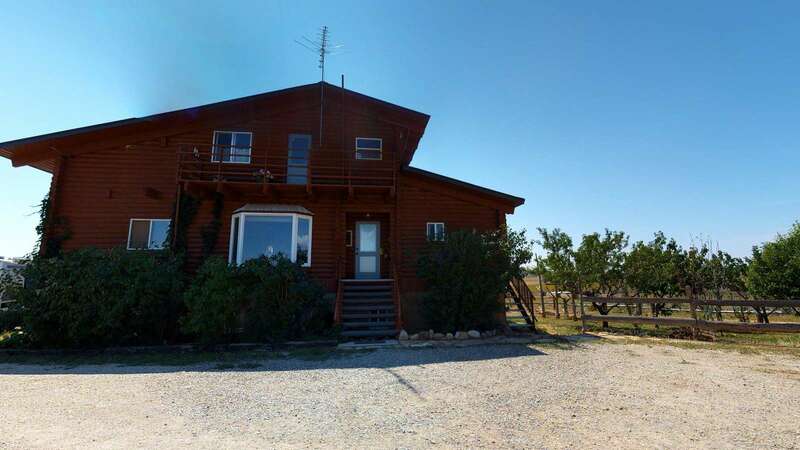 It was a gorgeous house, 3 levels, with a wraparound deck and a panoramic view of the nearby Abajo Mountains to the north and all the way to Shiprock, NM to the south. Hosts Allen and Leonie Hunt are the most charming and friendly couple, and their home reflects their wide interests and gracious style. When a rock fall on the trail caused a last minute ride cancellation, Allen came to the rescue by showing us some alternate routes we could follow. The resulting next day's ride was memorable for all. The home itself is warm and inviting, decorated in southwest motif with musical accents (the owners are accomplished musicians) and nods to Leonie's Australian roots. You can even play the marimba upstairs! 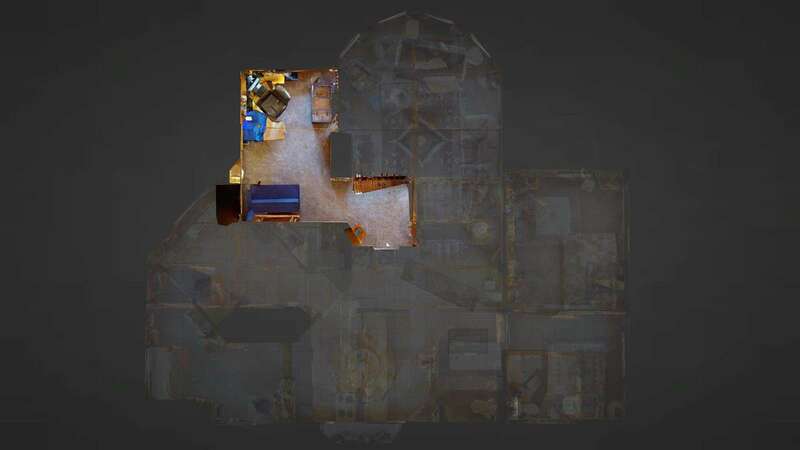 There are five bedrooms (4 queens and a bunk room), and the house has everything guests could want, right down to the ready-made pancake mix in the fridge. The large kitchen is a breeze to work in, even with lots of "helpers", and the big dining table with built-in lazy Susan avoids those awkward reaches across your neighbor's plate. Access is good, with a number of outside doors on each floor, but the spiral stairway between levels is VERY narrow, and handicapped or large guests will have to walk around the outside of the house to one of the other stairways. However, that just gives you more opportunity to cross paths with the many little cottontail rabbits that form the welcoming committee, and scamper about in the driveway morning and evening! 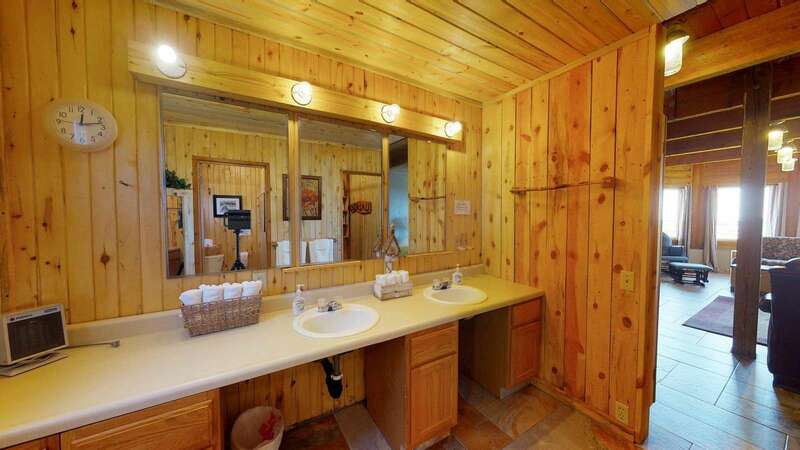 There is a full bathroom on each of the main floors. Supplies are well stocked and the Wi-Fi worked perfectly. A word of caution - the hot water system won't accommodate more than one person showering at a time, or you'll alternately freeze and boil! But it's a small drawback for such a lovely home. There is plenty of parking - our group easily found room to park FIVE truck-trailer combinations. The owners have even compiled a notebook with extensive ideas for nearby day trips. Our little bunch of friends had a delightful time at the Juniper Ridge Family Cabin, and highly recommend it for large families or groups, or even a romantic getaway. Five senior men enjoyed a pleasant stay at Juniper Ridge during a hiking trip in May, 2018. the home is spacious and wonderfully appointed. We each had our own bedroom, with the bunk bed room left over. We appreciated the great coffee maker, and the washer and drier. The property lends itself to relaxed evening conversations after each day of rigorous hiking in the surrounding Bears Ears and Cedar Mesa areas. 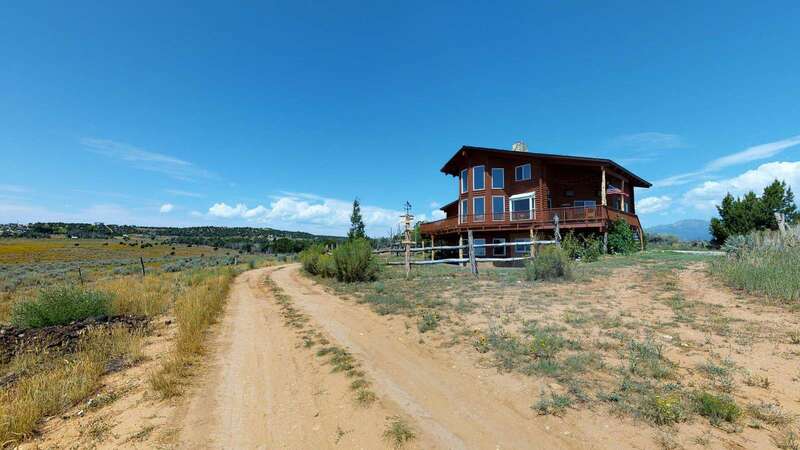 Juniper Ridge is a beautiful home with gorgeous views. Cleanliness, location, and open space in the home is most important to us, and Juniper Ridge was perfect. I traveled through with with my dad for local hiking and sightseeing the beautiful land --- & the recommendations & information on local hikes was great to have in hand & read a first hand account was super helpful in our planning. The home had plenty, plenty of space for the 2 of us, and a fully stocked kitchen - which was wonderful as we cooked for every meal --- & with random spices, which is always nice for travelers! Blanding has a grocery, with limited than most stores. Jerry & Duane were fast responders to our questions & helped quickly when we had a house issue. Thank you! 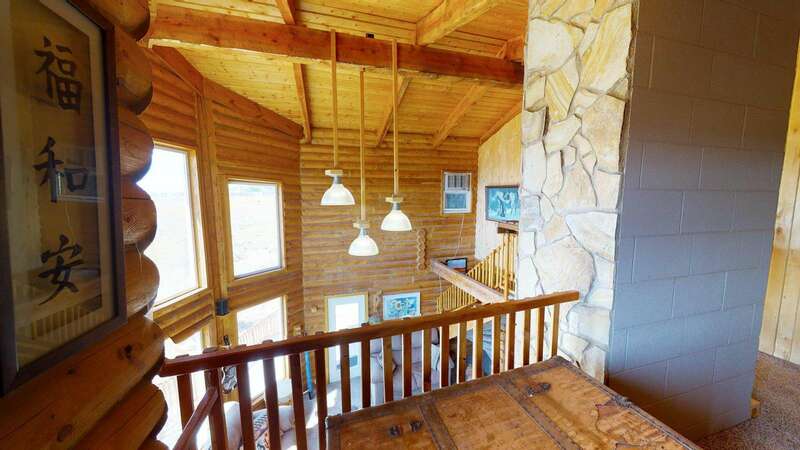 Beautiful juniper ridge log home with lovely decks and views. 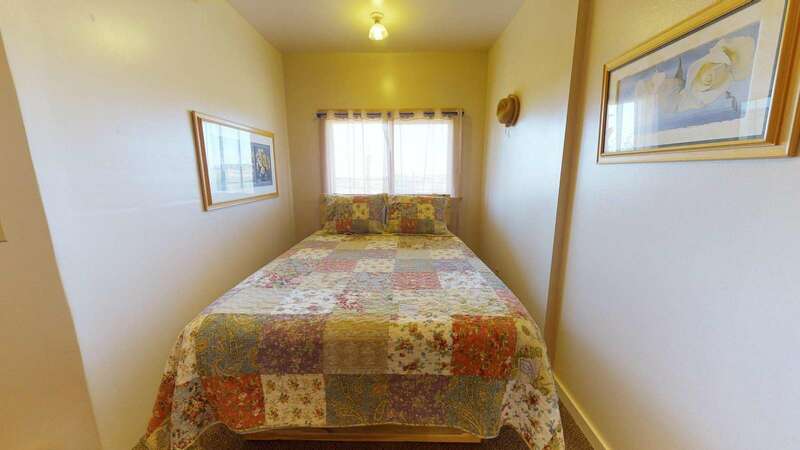 Definitely a lot of space, nice thick towels, comfortable beds, cozy decor. Kitchen had 2 cooking pots and one usable frying pan---a bit skimpy. That being said, there were amaple glasses and dishes, but no serving bowls. 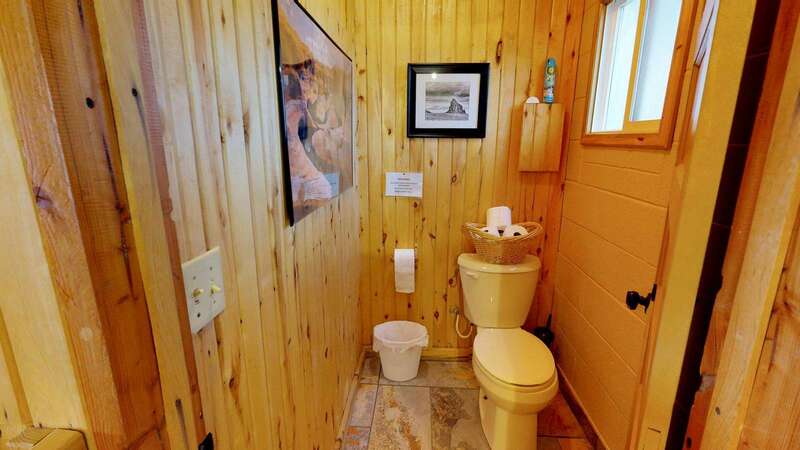 The plumbing is quirky and internet connection is sketchy. Would have given a 5 star rating if not for tge aforementiined. Response: Great to hear you enjoyed the home! Thank you for your comments regarding the lack of kitchen essentials and issue with the internet. We'll get it worked out. Hope to have you back again soon! The home is spacious, private and clean. We very much enjoyed the deck and star gazing at night. There are a couple of things to be aware of, however. First, the home is 3 stories. The top floor is merely a loft area with a futon and a desk. 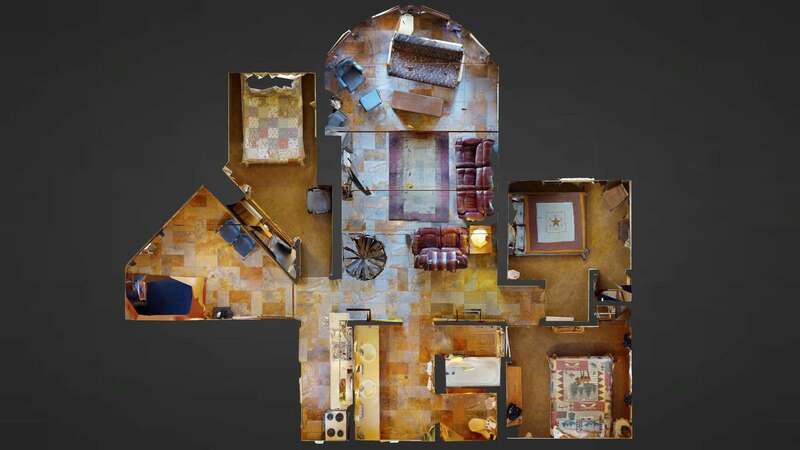 The main level is the kitchen, dining area, living room and only one bedroom and one of the two baths. That means all the other bedrooms are in the basement level. This is accessed by an extremely steep and narrow metal spiral staircase. Not good for seniors and likely not for children, either. 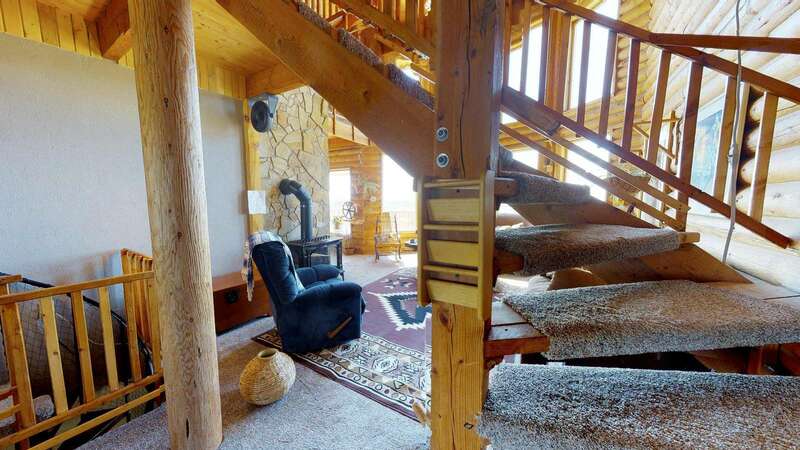 We felt this should be disclosed because, while we did enjoy the juniper ridge home, we would not have chosen it if we had known about the staircase. Response: We're glad you enjoyed the home! The spiral stairs are a bit steep and unique, however, there are doors on the lower level allowing access without using the spiral stairs. 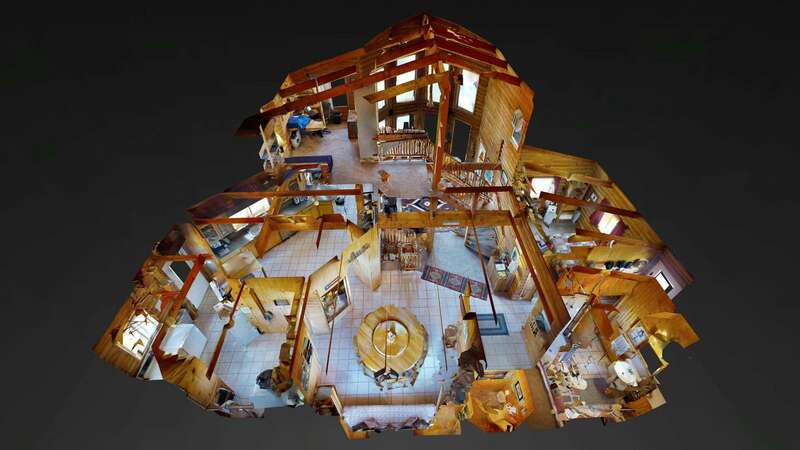 Also, we now have a complete 3D Virtual Tour of the Juniper Ridge so guests know exactly what they're getting. Best wishes and we hope to see you again! If you find yourself in southern Utah and want a serene place to rest and relax Juniper Ridge is the place. Blissfully quiet, with spectacular views of the horizon all around. We saw the Milky Way the night we stayed. 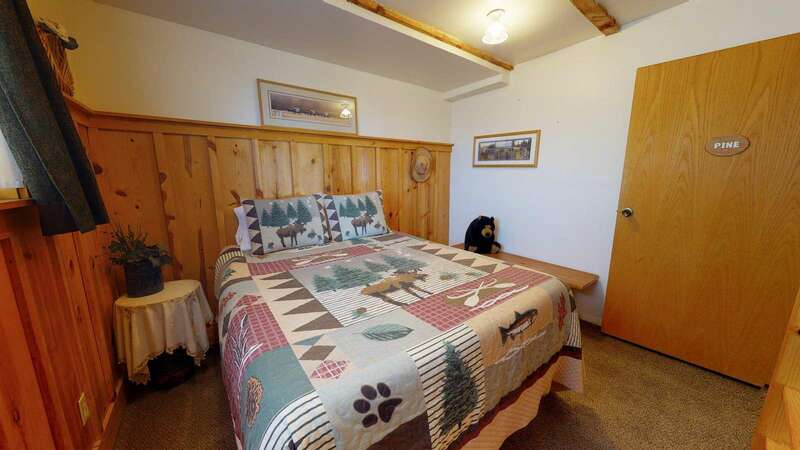 Really well stocked, the bed is very comfy, the property open and great for a dog with lots of wildlife to watch. The drive circles around the house so very trailer accommodating. I really can't say enough good about this place. Stay here if you can. The Juniper Ridge was better than expected. It is beautiful. The pictures online do not show the charm of the house. We used this as a base camp for a vacation. We saw Hovenweep Nat'l Monument, Natural Bridges Nat'l Monument, Bluff Fort, Goosenecks State Park, beautiful scenic drives on hwy 261 and 95, and a couple of evenings relaxing on the water of Reclamation Reservoir in Kayaks. It was a great vacation with our family. The night sky, the bucolic country scene and the tranquility of this charming home made our stay so perfect and loved. 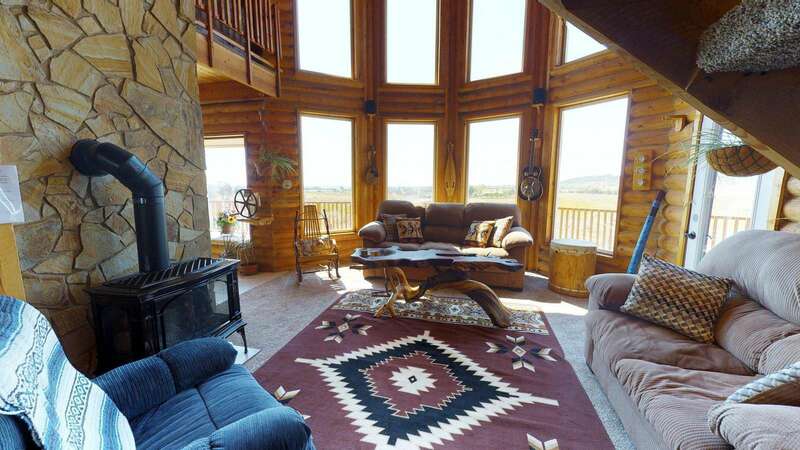 It has incredible views and is so very spacious and charming. Don't miss this experience if you are in the area- the home and it's setting is definitely one in a million! Juniper Ridge was a terrific place for our group of 10 people to stay. We were 2 couples, 3 singles and 3 kids and everyone had a place to be without feeling crowded. The owners of the home took great pride in making us feel welcome and comfortable. Juniper Ridge was a perfect place to stay for our family trip! Great space downstairs for the teenagers to hang out and upstairs the kitchen table along with the Lazy Susan was a big hit with Taco bar night! 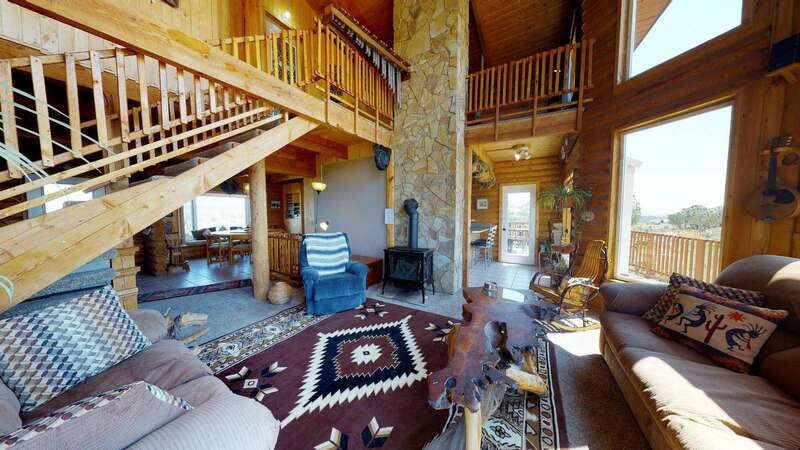 Nicely situated in Blanding and close to great trails in Arch Canyon. We loved it and when we come back we would love to stay there again! 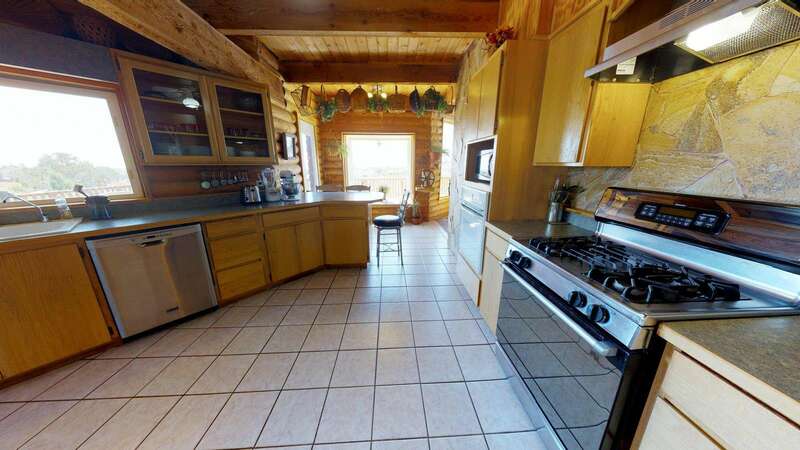 Great house that is off the beaten path in Blanding. Amazing for stargazing. Custom home. Surrounded by open land. Bring telescope for stargazing! We had never heard of Blanding before our trip, but we are now big fans! It was the perfect location for all of our adventures! Your Juniper home is lovely and also very warm and welcoming. We are grateful for your letting us use your home for our vacation. It was nice to meet you and we hope to be back in the near future. Juniper Ridge is a great house. Clean, neat, everything is perfect. We liked the stay and found it hard to leave for today’s travel. Thanks, and we hope to come back again someday. 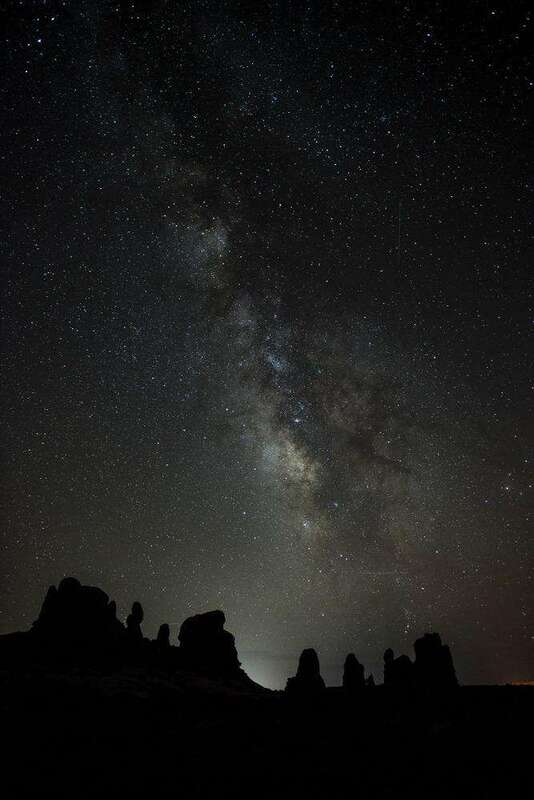 Plus, the night sky is stunning with galaxy and so many shining stars!!! Thank you for the great accommodations! We really enjoyed our stay and the beautiful view of the night sky! We hope to come back and stay nest time we make it to this part of the country. We enjoyed the clean juniper home and beautiful surroundings. This is a great home for small retreats. When booking, it would be nice if “cleaning fee” was included in nightly rental price… Thank you again. Thank you for a wonderful stay The house is beautiful. We so enjoyed our hikes to the ruins in Butler Wash and House on Fire. Wore the boys out! We highly recommend a trip to Hamburger Rock, though the falls at Indian Creek were dry. I can see it would be spectacular if they were running… We brought or 14 year old son and his cousin who is from Calgary, Alberta. Great food, great company, great time at juniper ridge. Thanks! Thank you very much for the wonderful stay. Everything was perfect, and your juniper home is absolutely beautiful. We loved the decoration and themed bedrooms. Our time in Utah was made much more amazing from your hospitality. You are incredible hosts. We will certainly recommend your home to others. Thank you again for everything! 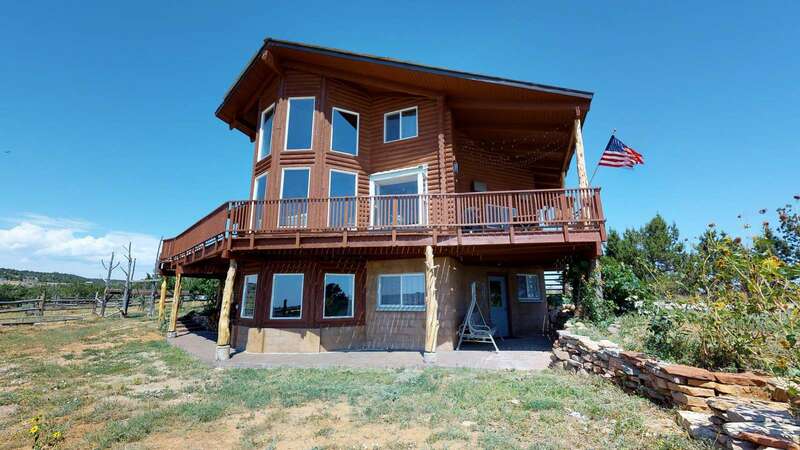 Thanks for sharing your lovely juniper ridge home with us! You are very lucky to be able to live here full time! Thanks for everything! We were the very first group of people to stay in the lovely and beautiful Juniper Ridge!! It couldn’t have been more wonderful of a stay! The home is absolutely incredible. I really don’t think there is much that needs to be changed in this home for guests. We give you guys 5 stars! We also love the two of you and thought you were very nice house owners! We did many things on our trip. We spent a day in Mesa Verde (amazing)! We took Allen’s advice and went to Lewis Lodge – it’s crazy that tourists actually go all the way to the actual ruin on the cliff. We decided that Lewis Lodge road is also a total 4-wheeling road! We spent a day at the hidden golf club also. (The Hideout, Monticello) That course is incredible! So pretty! 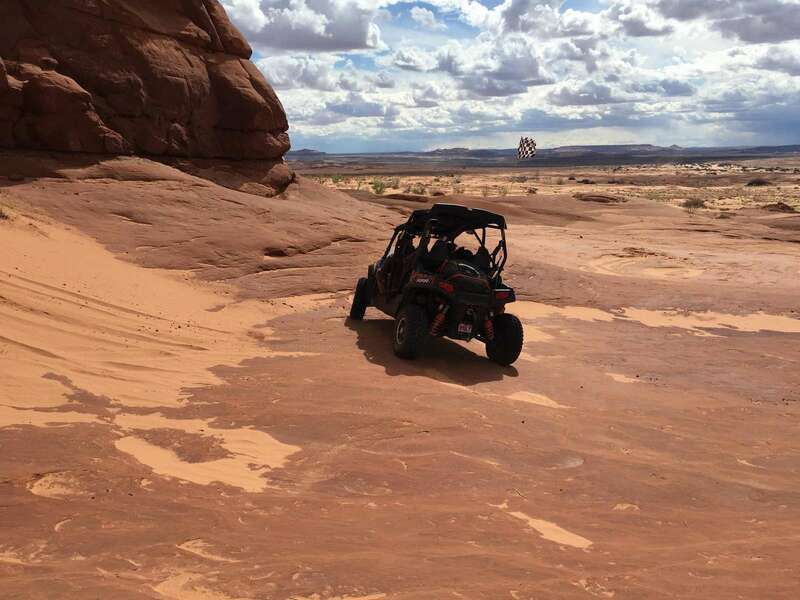 We are big Utah adventurers and are not super familiar with this area, so it was fun to explore and get to know the area more. We would definitely come back here another year! Thank you two again for sharing your home with us. It was an amazing vacation. THANK YOU! !